Average costs and prices of MRIs are presented here in two views. What is the cost of an MRI? MRI prices on Average, can range from $200 to $13,000 depending on what type of MRI is performed, the location you choose to have the procedure performed, and whether you add additional services. The average cost of an MRI in the U.S. is $2,600. 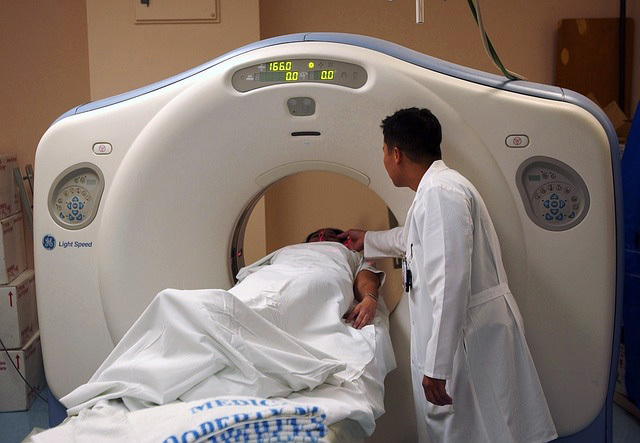 Additional prices can be added to the initial MRI procedure being performed as well, including if you or your doctor want a radiologist to read the MRI or use contrast dye, which enhances particular abnormalities on the scan that may not be visible otherwise. For uninsured customers, many testing facilities offer a 15% - 40% discount when cash or credit is used to pay the full discounted amount within 60 days of the procedure. The average MRI price without insurance can range from $1,560 to $2,210. Again, this can drastically change depending on where you go and what kind of discount they are willing to provide you for paying up front. Most insurance companies will reimburse the cost of getting an MRI. Typically when a medical professional requests a MRI, the procedure is automatically reimbursable depending on your insurance plan. If it is not fully covered, many insurance companies will cover some of the expense. Visit your insurance company’s website and/or contact them directly to figure out what is covered prior to the procedure. A good imaging facility can help you determine this with your insurance company as well. Medicare Part B covers diagnostic non-laboratory tests including MRIs when your doctor or other health care provider orders them as part of treating a medical problem. All people with Part B are covered, but deductible and copayment may apply. Cash pay price varies for those only covered under Part A. Visit the Medicare website for more information (www.medicare.org). States establish and administer their own Medicaid programs and determine which services are included within broad federal guidelines. The required mandatory benefits include performing diagnostic tests to follow up when a risk is identified. The optional benefits include other diagnostic, screening, preventive and rehabilitative services, which means it is going to vary from place to place whether or not the procedure is covered. It is strongly advised to determine your coverage based on the state you live in, prior to getting the procedure done. Visit the Medicaid website for more information (www.medicaid.org). Most medical imaging procedures, including MRIs, are quite expensive, which leads to increased frustration for many patients as they are already undergoing an uncomfortable procedure. Doing your research beforehand in order to find the best facility, radiologist, and price for you can significantly lessen the aggravation these procedures bring. Under the current healthcare landscape, hospitals, imaging centers, and doctors can charge what they want for the procedures they perform and in many cases, do not have to justify or even disclose prices prior to the procedure being performed. Because they very rarely reveal their prices up front, the same exact procedure can be hundreds if not thousands of dollars cheaper at a similar location, which could likely be just down the street. Ultrasounds, MRI, PET, CAT scans, etc. are nearly 2/3 LESS costly at free-standing, in-network imaging centers than at hospitals. It is absolutely imperative that if you have insurance, Medicare, or Medicaid that you are familiar with the details of your particular plan prior to having any procedure performed. Make sure to research or contact the company beforehand as coverage policies are constantly changing. The exact same procedure can differ drastically in price depending on where you have the procedure performed, so it is essential that you take the time to shop around for the best place that suits you and your needs. Whether a local hospital or imaging center, it is very important that you find a location that will make you comfortable during a sometimes-uncomfortable situation. Most importantly, you want to find a good, qualified radiologist or radiology facility, while also finding the best possible price.